NASHVILLE – Eighteen lineworkers from co-ops across Tennessee are heading to Virginia to assist with power restoration after a strong storm system moved through the region overnight and early Friday morning. Widespread wind, rain and snow has left more than 900,000 people without power in New England and the Mid-Atlantic states. Six lineworkers from Appalachian Electric Cooperative in New Market are traveling to Northern Virginia Electric Cooperative in Gainesville, Va.; six lineworkers from Holston Electric Cooperative in Rogersville will assist Central Virginia Electric Cooperative in Arrington, Va.; and six lineworkers from Plateau Electric Cooperative in Oneida will assist Mecklenburg Electric Cooperative in Gretna, Va.
Central Virginia experienced sustained winds of 20 to 30 miles per hour with gusts approaching 70 miles per hour as the storm moved through, toppling trees and damaging power lines. 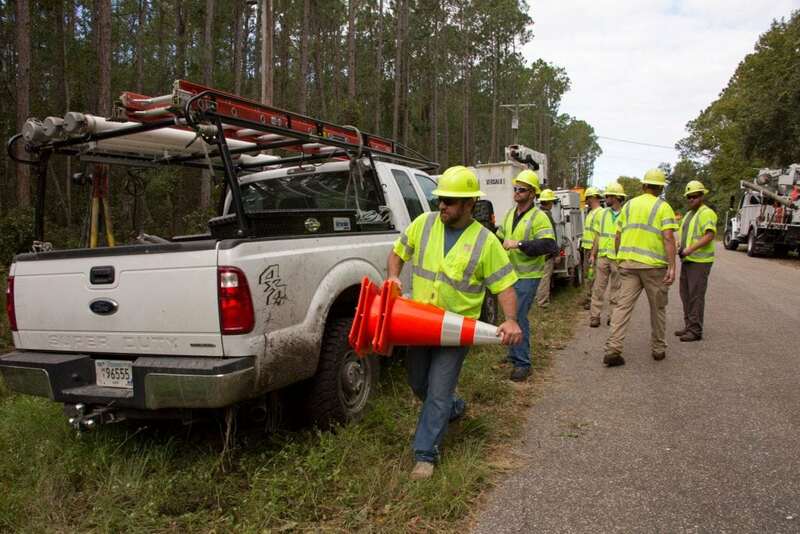 File photo – Duck River EMC crews respond to storm damage in Florida. Photo by Robin Conover.